TheGothic Art Period in art history began somewhere in Europe circa 1150 to 1200 A.D. and lasted until about 1440 A.D. Florence. Art to this point had lost it's classical influence during the Middle Ages due to the invading Goths and Germanic Tribes around 400 A.D. In some areas of Europe this art period lasted 150 years and in others three or four hundred. Famous artists of early Gothic art were Cimabue, Duccio, Giotto and Simone Martini. One of the first famous paintings of this period was Cimabue’s "Madonna Enthroned", 1280-90. 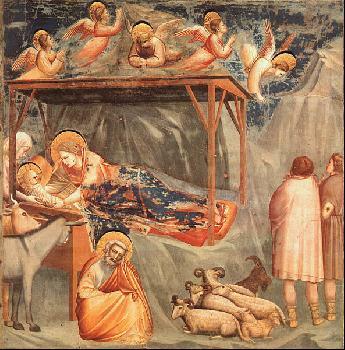 Until Giotto Italian art was heavily influenced by Byzantine art due to close proximity with the Byzantine civilization. As a result Italian artists worked in mosaics, painted murals and executed panel paintings. Artists used tempra, an egg based medium when painting altarpieces. The panel was prepared with a mixture of plaster and glue sometimes reinforced with linen. To this was added red sizing and gold leaf and on top of this where needed and undercoating was used before putting down pigment. Many layers of tempra were put down thinly before the artwork was complete. Gothic art paintings in the Byzantine period were flat having no depth. Artists articulated everything on the same foreground plane with no recession backward into space beyond the figures themselves. In many cases the background was rendered in a plain solid gold color with no delineation or atmospheric perspective. The figures in Byzantine art, opposed to Gothic art, were monumental in size, very rigid, solid, static, having no interaction with other figures in the painting showing no emotion. In some of the famous paintings the figures were outlined with a dark color so they could be seen easily from a distance, and almost always the figure looked straight out at the viewer. Byzantine painting for the most part only used few colors. The art was rich, decorative and very ornamental. In art history Famous artists in Gothic art began to make improvements on this style. Figures became more modeled, realistic, life-like, active, emotional, and interactive among themselves. Artists attempted to paint their figures occupying space and in some cases seemed to recede into the background. Artists in the Gothic painters began to pay more attention to nature and tried painting the world more realistically. Two artists and their famous paintings during the Gothic period in art history are Duccio, “Christ entering Jerusalem, Maesta Altar, 1308-11 and Cimabue, “Madonna Enthroned”, 1280-90. To view the poster gallery of Gothic Art click here. Art from the renowned artist Ilina Filipova consisting of rare Christian art in the field of Byzantine art with crosses, Jesus, saints, Madonna and angel icons all in her online art gallery.